Instructions on how to adopt a beagle from Nittany Beagle Rescue and the adoption application form can be found on the Adopt a Beagle page. Meet Albert! He used to be called Tucker, but his foster family thinks Albert is a more fitting name! 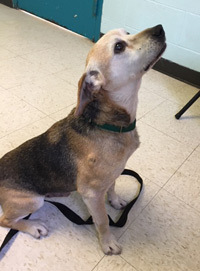 Albert was surrendered to an area shelter because his person moved, but Nittany Beagle Rescue was able to take him. Albert is very affectionate. He's quite lively! He loves treats & he will sit for a treat. In one photo, a person is holding a treat for him & he would love to have it! Albert is good with children & other dogs (although big dogs scare him). He rides really well in a car. Albert is housetrained and is excellent in a crate. However, he does have some accidents that can be solved by him wearing a belly band. Albert goes all night without having an accident & he sleeps in the crate at night. Albert is a little guy - he only weighs about 22 lbs. Because he's an older fellow, he won't be placed in a home with young children. Albert is up-to-date on vaccines & neutered. Please give Albert his forever home! Click on his page to see another picture of Albert! Hi! 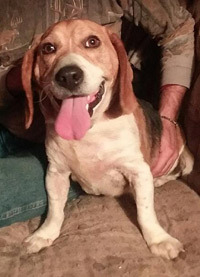 My name is Duke & I'm a 4-year old male beagle! I'm a big boy - I might be close to 50 lbs! But I'm just a sweet lug of a guy! I've been around other dogs & cats & I'm good with them! I really like to play with other dogs & cats! I've been around children from ages 2 years old & older, & I'm playful & jump on them. I've never lived with children, though. Prior to coming to Nittany Beagle Rescue, I lived as an outside dog. I've been in a foster home for awhile & I've learned all about housetraining. I would do best in a home with a fenced-in back yard. I need work on walking on a leash. I like to bark at other dogs & cars as I go by! I'm not aggressive at all, but I'm a big boy so I can be hard to manage. So if I'm in a home with a fenced-in yard, my people can work on leash training me gradually. Prior to coming to Nittany Beagle Rescue, I had some skin problems & the vet thought I may have a food allergy. However, I've been fine since coming to Nittany Beagle Rescue. I love baths! I'm already neutered. I'm a great dog! Please think about making me part of your family! Hi! 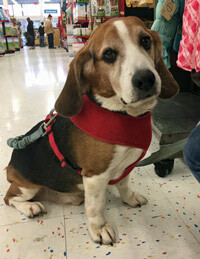 My name is Eli & I'm a wonderful male tricolor beagle. I'm so friendly! I'm good with other dogs, cats & I'm housetrained. I'm about 10 years old, & I haven't been around children much. I'm pretty overweight right now, but Nittany Beagle Rescue is working with me to lose some of my excess weight. Eli tore his ACL and needs surgery to fix it. But 1st he has to lose 10-15 lbs. The surgery will take place in State College. Please think about making Eli part of your family! He is already neutered & up-to-date on vaccines. Click on Eli's page to see a different photo of him! Hi! My name is Esther, & I'm the sweetest beagle girl! I'm 8-10 years old, & I'm a tricolor beagle. I love people & adore attention! 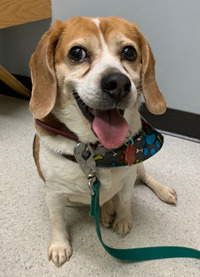 When I came to Nittany Beagle Rescue, my teeth were in horrible shape. But I just had a major dental. I had to lose 11 teeth (some of them actually fell out)! But my mouth feels much better now! The people at the vet's office think I'm just adorable! I'm excellent in a crate. Nittany Beagle Rescue isn't sure if I'm housetrained, but they think I am. 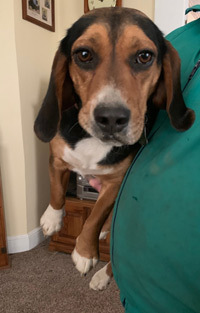 Because we do not know Esther's background, Nittany Beagle Rescue will not place Esther in a home with children under 12. Esther is spayed, up-to-date on vaccines, & microchipped. Esther is living in a boarding kennel & anxious to find her forever home! Please think about making Esther part of your family! Click on her page to see another picture of her! Hi! 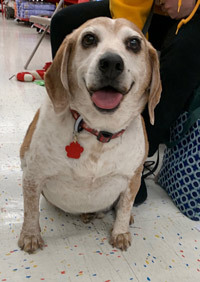 My name is Frances & I'm a wonderful male senior beagle! I'm a very calm & easygoing guy! I'm also affectionate & loving (although I don't really give kisses). I'm great with other dogs. I tend to be submissive with them. I am housetrained and cratetrained, and I'm used to being crated when no one is home. At night, I usually sleep on a dog bed, but I would love it if you let me sleep in bed with you! I also like to hang out with my people on the couch (although you may need to help me up & down). I ride really well in a car! I like to hang out in the back seat & look out the window. I also like to play fetch! I'm anxious to find my forever home! Please think about giving me my forever home for my golden years! I am neutered, up-to-date on vaccines & microchipped. My photo is coming soon! UPDATE! Hunter has some health issues & he is in a permanent foster home! My name is Hunter & I'm an affectionate & loving boy! I need a new home! I'm adorable! I'm a very friendly fellow, & I love attention! I'm a well-behaved fellow! Also, I'm quiet for a beagle! Children of all ages visited with me when I was younger, & I was very good with them. I'm fine with cats. I need a new home because I didn't get along with the other male dog in my home (we are both neutered, but I want to be head dog). I did live with a very submissive female dog before the other male came to my house, & I got along great with her. But at this point, I would probably do best as the only dog. I am housetrained, but I will have an occasional accident. I don't like being in a crate - it makes me very anxious. I would love a home where my person is home a lot! I'm super affectionate & just want to be with my person giving them lots of love! I'm used to sleeping in bed with my person at night. I can be protective of my person, so I might growl at a strange person who comes into the house. Hunter is neutered, up-to-date on vaccines & 10 years old. Click on Hunter's page to see another photo of him. Hi! 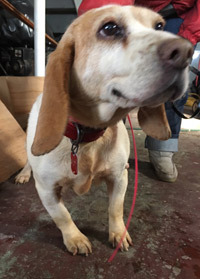 My name is Pixie & I'm a small (but stocky) tricolor female beagle. I'm a young girl - just under 2 years old! I'm a little thing - just over 20 lbs. I look like a Pixie! I love to be with people! I'm just so loving & affectionate! I'm quite active, which is normal for a young beagle. I like to play tug-of-war! I was rescued from a bad situation by a kind woman, but she wasn't able to keep me because I didn't always get along with her dogs. I like my toys, but I don't want to share with other dogs. I'm also protective of my dog treats around other dogs. But I'm fine with food & treats & toys with people! So I would do best as an only dog since I'm possessive that way. I haven't been around cats, but I'm probably fine with them (although I may chase them, at least at first). I'm working on housetraining. Also, I'm working on learning how to walk on a leash. I can be timid when you make fast moves. I ride well in a car. I just lay quietly in the back seat. I am up-to-date on shots, but will be spayed before I'm adopted. I'm living in a boarding kennel & anxious to find my forever home (or a foster home who can keep me while I wait for my forever home!). Click on my page to see a different photo of me! As you can see, I love to be held! Hi! My name is Star & I'm a 5-year old female lemon & white beagle. I'm an easygoing & loving girl! I'm also quite active, & I love to run & play! Prior to coming to Nittany Beagle Rescue, I never had any toys, so I'm still figuring out what to do with them. I've been in a foster home for a few months, & I'm doing well! I'm good with children (7 and older), other dogs & cats! However, I may bark or chase the cats at first. Prior to coming to Nittany Beagle Rescue, I had been living in a crate for 2 months. I'm housetrained. Usually I bark and whine when I need to go outside. But I might also need some work on house manners when you first take me home. I'm used to being crated at night. I'm short and stocky, and so I'm fairly strong when I pull on the leash. I will take off if you drop my leash, so it's important that I'm always on a leash or in a securely fenced yard when outside. I do well in a car, although I've always been in a crate when riding in a car. I am spayed and up-to-date on shots. Please think about making me part of your home! Click on may page to see another photo of me! © 2003-2019 Nittany Beagle Rescue. All rights reserved.